The flag of Bulgaria (Bulgarian: знаме на България, [znamɛ nɐ bɐɫˈɡarijɐ], zname na Bǎlgariya) is a tricolour consisting of three equal-sized horizontal bands of (from top to bottom) white, green, and red. The flag was first adopted after the 1877–1878 Russo-Turkish War, when Bulgaria gained independence. The national flag at times was charged with the state emblem, especially during the communist era. The current flag was re-established with the 1991 Constitution of Bulgaria and was confirmed in a 1998 law. A horizontal tricolour of white, green and red. From 1946 until 1990 the emblem of the People's Republic of Bulgaria was placed on the left side of the white stripe. It contained a lion within a wreath of wheat ears below a red star and above a ribbon bearing the date 9 September 1944, the day of Bulgarian coup d'état of 1944 which led to the establishment of the People's Republic of Bulgaria. In 1971, it was changed so the ribbon bearing the years 681, the year of the establishment of the First Bulgarian Empire by Asparukh and 1944. A popular version of the flag, which has no official status, is also commonly known. It has the full coat of arms on the left of the flag, placed across the white and green fields only. “ Art. 15. (1) The national flag of the Republic of Bulgaria is a national symbol which expresses the independence and sovereignty of the Bulgarian state. 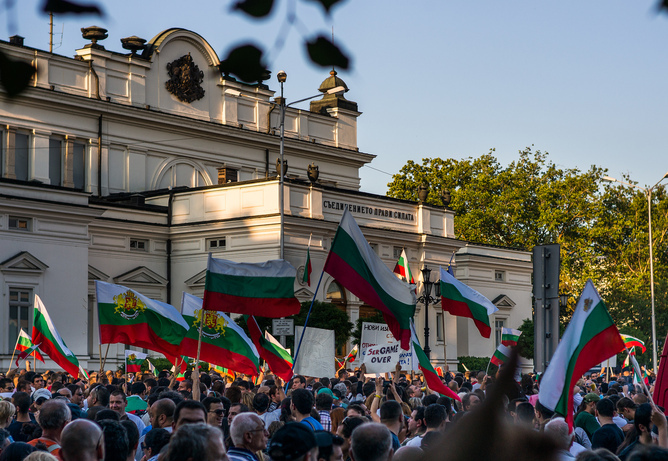 (2) The national flag of the Republic of Bulgaria is tricolour: white, green and red fields, placed horizontally from the top downwards. On fixing the national flag in a vertical situation of the carrying body the colours shall be arranged from left to right - white, green, red. Flag of Bulgaria (1948–1967). Valid since 27 January 1948. Flag of Bulgaria (1967–1971). The design of the emblem has changed slightly from the previous version. Valid since 14 June 1967. Flag of Bulgaria (1971–1990). The indication of 681, the year of the establishment of the First Bulgarian Empire by Asparukh, was added to 1944. Hoisted for the first time on 21 May 1971. Bulgarian People's Army war flag from the Communist era. The motto in Bulgarian means "For the socialist motherland". Current Bulgarian war flag, similar to Bulgarian war flags from period 1880s–mid 1940s. The motto in Bulgarian means "God is with us". ^ Whitney Smith. "Flag of Bulgaria". Encyclopædia Britannica. Retrieved 2017-12-08. ^ "Tarnovo Constitution of 1879" (in Bulgarian). Juridical Encyclopedia. Archived from the original on 2007-09-11. Retrieved 2007-09-15. ^ "Understanding the Bulgarian Flag". Information Bulgaria. Retrieved 2017-12-08. ^ "Constitution of the Republic of Bulgaria". National Assembly of the Republic of Bulgaria. Retrieved 2007-09-15. ^ Unofficial flag Archived 2014-04-08 at the Wayback Machine, taken from 2013 Bulgaria Summer Protests, Darik News, 26 June 2013, and unofficial flag, taken from Protests in Bulgaria: the unnoticed uprising, TheConversation.com, 24 Jun 2013. Both retrieved 27 Jun 2013. ^ "Law for the State Seal and National Flag of the Republic of Bulgaria". National Assembly of the Republic. Retrieved 2007-09-15. ^ a b c Government of Bulgaria (2005). "Bulgaria's National Flag". Archived from the original on 2009-02-08. Retrieved 2007-11-09. ^ PANTONE. "PANTONE 17-5936 TCX Simply Green - Find a Pantone Color - Quick Online Color Tool". Pantone.com. Retrieved 12 December 2017. ^ PANTONE. "PANTONE 18-1664 TCX Fiery Red - Find a Pantone Color - Quick Online Color Tool". Pantone.com. Retrieved 12 December 2017. 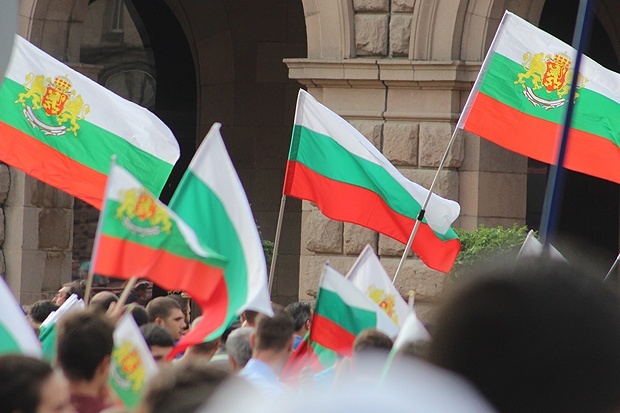 Wikimedia Commons has media related to Flags of Bulgaria. Voynikov, Ivan. "Part II. The Bulgarian flag through the centuries". History of the Bulgarian State Symbols (in Bulgarian).